This entry was posted in Maria Comparetto on September 23, 2010 by admin. London Fashion Week has been busy for Maria Comparetto. (Deep breath)… starting on Thursday, she attended the Triumph Fashion awards (with Matthew Williamson, Helena Christensen and Rankin judging). Then it was on to the Cat Deeley/Links party at the Ivy Club then to Momos where she danced until her feet hurt! 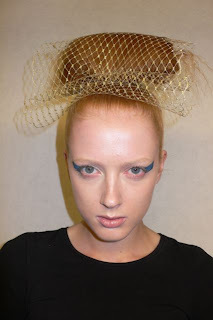 Bright eyed and bushy tailed on Friday it was off to head a team from MAC on the Jayne Pierson in collaboration with Vogue Italia Presentation for London Fashion Week On/Off schedule. To create the amazing graphic metallic eye, inspired by the colours used in the collection, Maria used the Mac ‘Hyacinth’ pencil to make the shape, pressed in ‘Deep Truth’ shadow to set then used ‘Naval Blue’ pigment powder to give a metallic finish to the eye. Maria said, “The trend this season is no mascara, this gives more impact to the graphic eye shape”. Lips were blocked out using Mac ‘Dim’ then a light stroke of ‘High Tea’ lipstick was applied. The whole look was a nod to the 80s with a fresh modern twist. No surprise there was an excellent reception to the show and to Maria’s make-up. Maria herself had her eye on the gold structured shirt. 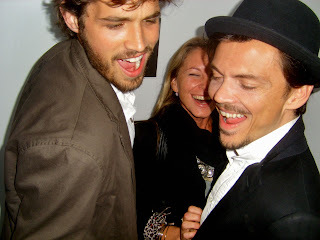 Drinks at “fashion week fashion strong” on Monmouth Street followed. Interesting about not wearing mascara for next season. Thanks for the tip!